The man who built this barn was around 10 years old at the end of the War Between the States.. His descendants agreed for me to photograph it and gave me a few details about the structure. Our story includes some detailed pictures of the barn's innards. But some things bear a second look. 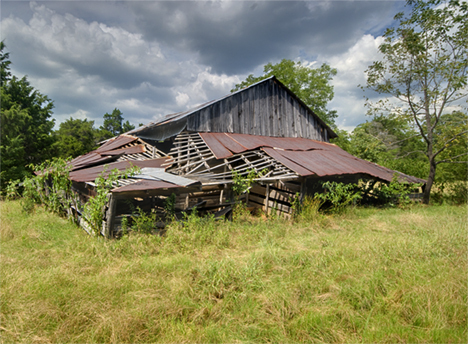 There has been recent interest expressed in photographing and documenting old barns. It’s nice to know I am no longer alone in this pursuit. Turns out there is a National Barn Alliance too. I did this story originally in July, 2010. At that time the structure of the original building was sound for the most part. As you can see, you can’t say as much for the add-ons that are omnipresent in most southern barns I see. Let’s hope not much has changed in a couple of years. See our original Cool Country Barn post here. Be sure and see the original Corndancer Photo of the Week story as well. Click here for a gallery of 20 pictures of the old barn including inside the structure plus a couple of old churches and a surprise critter. Click here for a gallery of 42 color and black and white pictures of the barn, plus a churches and critter. This is a flash gallery which Macintosh computers don’t like.